Frequency is horizontal scrolling blog and portfolio theme. Outstanding horizontal scroll will draw attention of all visitors. 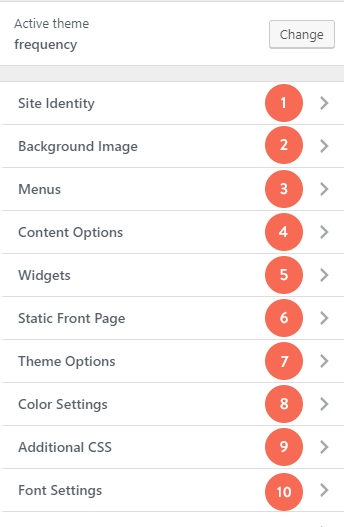 Go to your website’s WordPress dashboard, then go to Appearance -> Themes. Click on Add New, and then Upload from the navigation bar right below it. Click on Choose File, and browse your computer for frequency.zip file and click Install Now. After the installation is complete, click on Activate link. IMPORTANT NOTE if you bought the theme from ThemeForest: Please do not upload the whole file you have downloaded. Open the file first, then find the frequency.zip file inside the WP folder – then upload only that zip file. First things first, you will need an FTP client (FileZilla is free, easy to use and it works on Windows, Mac and Linux) to access your web host server. Once you download Frequency, find the frequency.zip file in the WP folder. Extract it, and upload it to your server in the ..wp-content/themes/. Once it’s done, activate the theme: go to your WordPress dashboard and navigate to Appearance -> Themes, search for Frequency and click the Activate link right below it. IMPORTANT NOTE if you bought the theme from ThemeForest: Please do not upload the whole file you have downloaded. Open the file first, then find the frequency.zip file inside the WP folder – then upload only that zip file. If you’re stuck, here’s a detailed way how to install themes. Frequency uses the latest post reading setting. 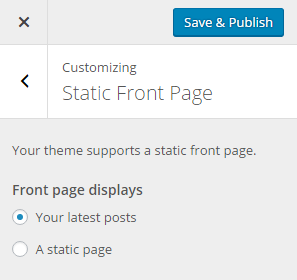 Of course, you can set the theme to display desired static page instead of posts, but you will also need to create a posts page. 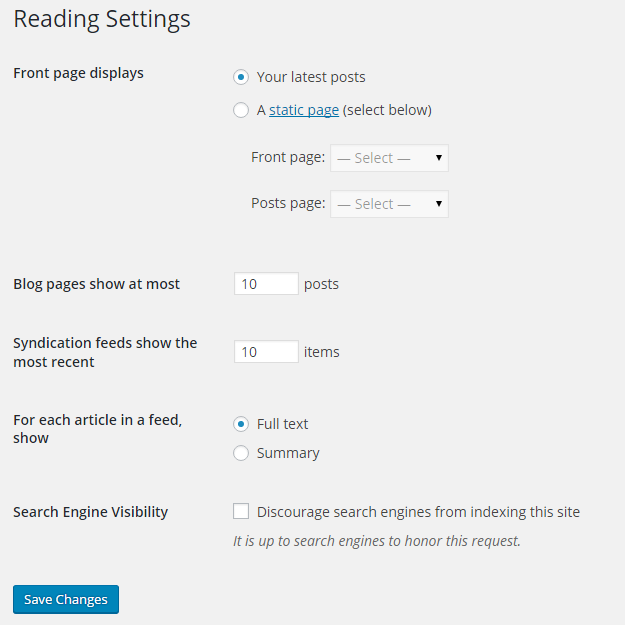 Go to your website’s WordPress dashboard, then go to Settings -> Reading. Set the Front page displays option to Your latest posts. Press Save Changes. Go to your website’s WordPress dashboard, then go to Pages – > Add New. Create a new page – enter a title (e.g. Home). Click on Publish. Now create another page (e.g. Blog), with the Default page template, using the same method. When you are done, go to Settings -> Reading. and set the theme to display static page. Then select previously create pages – for Front page select your desired page (e.g. Home), and for Posts page select your page with Default page template (e.g. Blog) . The page you select for your Post page will display all blog posts. Press Save Changes. The next important thing to do is to set your permalinks. We strongly suggest the use of pretty permalinks. Go to Settings -> Permalinks and select Post name. To take advantage of Frequency‘s advanced features, you have to install and activate the Jetpack plugin. Do I have to use Jetpack? Yes. Jetpack is a mandatory plugin for the Frequency theme. It’ll let you include a lot of handy features to your site like security, design tweaks, backups, sharing and more. To use Jetpack, please sign up for a WordPress.com account. How do I install Jetpack? The latest version of WordPress. A WordPress.com account. Sign up for one here. A web site that’s publicly accessible (not hidden/private). The easiest way to install Jetpack is from within WordPress itself. Log in to your site and head to your dashboard, click on the Plugins tab in the left panel, then click “Add New.” If you search for “Jetpack,” you’ll find the latest version. Install it by clicking “Install Now”. After that you’ll have to connect your WordPress.com account. After successfully connecting to your WordPress.com account, you’ll see a list of features Jetpack offers. Most of them are automatically activated. For more details and support with installation, visit the official Jetpack installation guide. How do I use Jetpack in Frequency? Jetpack has “modules” – tiny features that let your site do more things. You can see which modules Jetpack has by going into Jetpack -> Settings. They’re divided into five categories (General, Engagement and so on). We’ve highlighted the most important modules that work great with Frequency. The Custom Content Types module adds custom post types (CPTs) to your site. These CPTs allow you to add content that doesn’t necessarily fit into a post, but isn’t right for a static page either. Since this is part of Jetpack, you can even switch themes without losing these custom post types! Jetpack supports a few custom post types, but the most important one for Frequency is the Portfolio custom post. The Portfolio custom post type gives you an easy way to manage and showcase projects on your site. Then, go to Settings → Writing in your WordPress Dashboard and check the Portfolio Projects option under “Your Custom Content Types.” You can then choose to display the portfolio using the portfolio shortcode [portfolio] or with a link to the portfolio in the menu. A contact form is a great way to offer your readers the ability to get in touch, without giving out your personal email address. You can add a contact form to any post or page. To get started, click the contact form icon above the post editor. Note: you can only have one contact form per page. With the Tiled Galleries module you can display your image galleries in three new styles: a rectangular mosaic, a square mosaic, and a circular grid. The rectangular and square tiled layouts also have hover-over captions to save space while making captions accessible. Make sure the module is activated in Jetpack settings. Create a new gallery with the “Tiles” option selected. Go to Jetpack -> Settings -> Appearance and turn on the Carousel module. Once on, any standard WordPress galleries you have embedded in posts or pages will launch a gorgeous full-screen photo browsing experience with comments and EXIF metadata. Once you activate the Carousel module, you will find the settings in your Dashboard under Settings -> Media. For more information on Carousel and its options, see the official Jetpack Carousel documentation. Shortcodes allow you to embed videos from YouTube, tweets from Twitter, and other media across the web directly in to your WordPress-powered site. For a full list of which shortcodes Jetpack support, see the official shortcode documentation. The “Extra Sidebar Widgets” module includes widgets you can add to your blog. From RSS Links to Twitter Timelines and Facebook Like Boxes to social icons, this module makes it easy to add extra functionality to your site. Once enabled the module adds the widgets, login into WordPress admin panel and go to Appearance -> Widgets. See the full list of all Widgets added by the Extra Sidebar Widgets module. The Widget Visibility module enables you to configure widgets to appear only on certain pages (or be hidden on certain pages) by using the Visibility panel. Go to Jetpack -> Settings -> Appearance, and turn on the Infinite Scroll module. Then, in your WordPress dashboard under Settings -> Reading, make sure that “Scroll Infinitely” is checked. The Sharing module gives your readers the tools to post your content to social networks from the bottom of each post and/or page. First, make sure that the Sharing module is on. Go to Jetpack -> Settings -> Engagement and see if Sharing is turned on. Then, go to your dashboard Navigate to Settings –> Sharing in your site’s dashboard. Hit “Save” in the end. You can add Captcha and have more fun with sharing. Learn how at the official Jetpack Sharing module documentation. The Related Posts feature scans all of your posts, analyzes them, and lets you show contextual posts your visitors might be interested in reading next. Go to Jetpack -> Settings -> Engagement -> Related Posts to turn this module on. What about all the other Jetpack modules? Feel free to use them! Frequency supports Jetpack and its modules. We’d recommend turning on any module you need, and turning off any module you don’t need (so as not to overwhelm your site). Yes. Jetpack offers full, free support. If you have a Jetpack related problem, please contact their support agents. IMPORTANT: Before importing content, please make sure to install Jetpack! You can make your website look exactly like a Frequency demo. This is handy if you are in a hurry and need to get your website quickly set up. Just don’t forget to change the posts and images with your own after you finish importing. 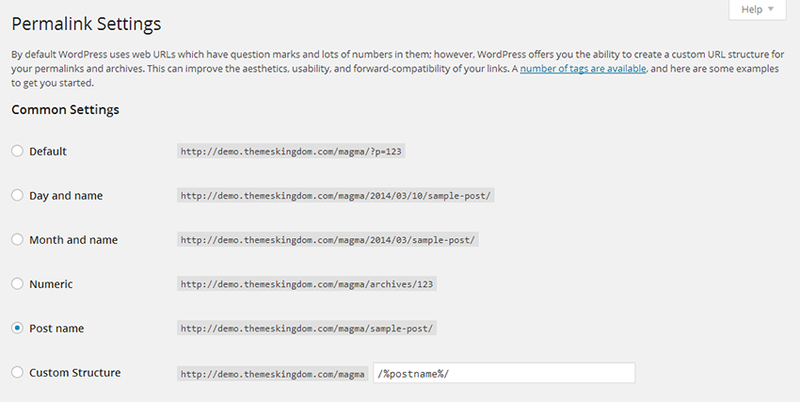 Go to your website’s WordPress dashboard, then head to Appearance -> import Sample Data. First select the demo you want, then click Import Demo Data. Please note the import will take a while – a lot of images and content need to be imported. Give it a few minutes. Note: If the demo import suddenly stops, simply select same demo again, and click on Import Demo Data again. Depending from your server configuration, you might need to do this a few times. Add the set_time_limit(240); line to your wp-config.php file. Install the WP Maximum Execution Time Exceeded plugin. Here’s a detailed explanation how to Import demo content. Logo: Upload logo for your site. Logo should be in PNG or JPEG/JPG format. 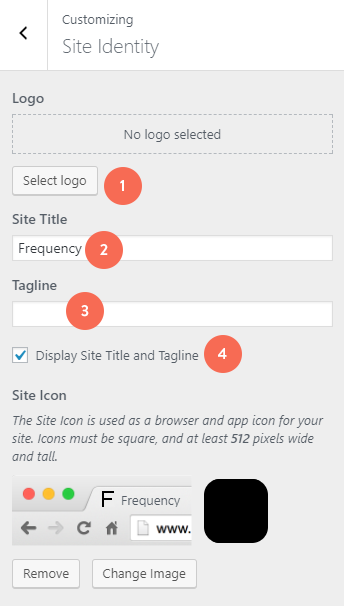 Display Site Title and Tagline: If enabled, both site title and tagline will be displayed. Tagline will be displayed under the title. This option allows you to quick manage created menus. 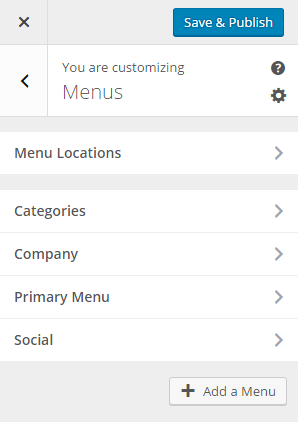 You can select which created menu will be displayed as Primary Menu or Footer Menu. If you need to manage actual menu items, you can do that in Appearance -> Menu. 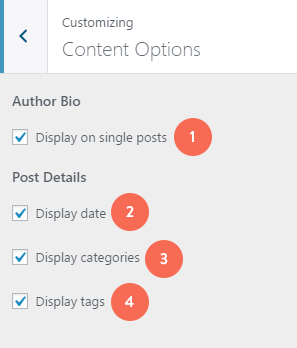 Content options panel contains settings for meta data for single posts – both regular and portfolio. Author Bio: If enabled, author bio box will be displayed on single post page. Display date: If enabled, publishing date will be displayed on single and posts page. Display categories: If enabled, post categories will be displayed on single and posts page. Display tags: If enabled, post tags will be displayed on single and posts page. 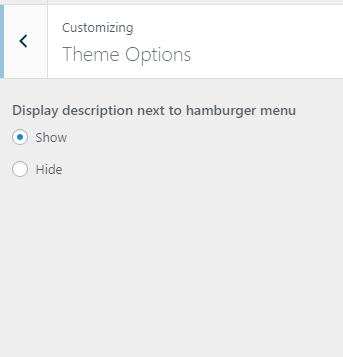 Theme options panel allows you to enable or disable title Menu near hamburger menu. 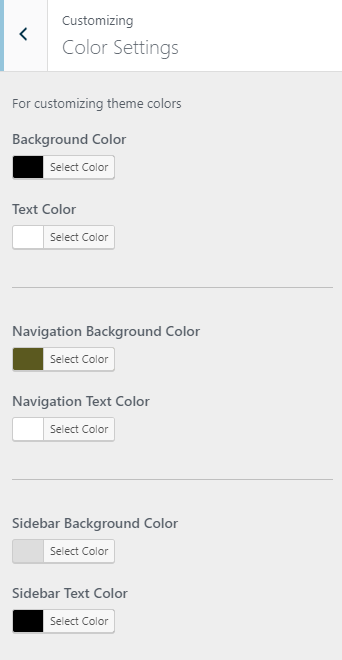 Colors panel allows you to set header text and background colors. 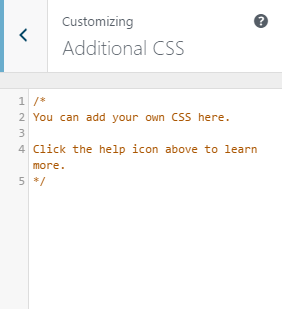 In additional CSS section you can enter your custom CSS classes, so you don’t need to mess with original styles, or create child theme. Of course, you should create child theme if you plan to modify other files as well. Font settings allows you to set font family and font weight for headings and paragraphs. Frequency comes with one menu location – primary, or header menu. Frequency theme have only default sidebar. If you have enabled Widget Visibility feature from JetPack, you will be able to set widget visibility depending from post or page. Visibility works in simple if or if not logic. This means that you can set widget to be visible if some condition is, or if it’s not matched. Widget visibility options will be displayed as part of the widget. Frequency theme comes with several different post formats: Standard, Gallery, Video, Quote and Link. Portfolio is a custom post type that comes with Frequency. Portfolio posts are used to display your work on a page with a Portfolio Template. Portfolio items can be associated with Portfolio categories. Project Types: Types are the same as categories. Each project can be filed under one or more categories. This aids in navigation and allows projects to be grouped with others of similar content. 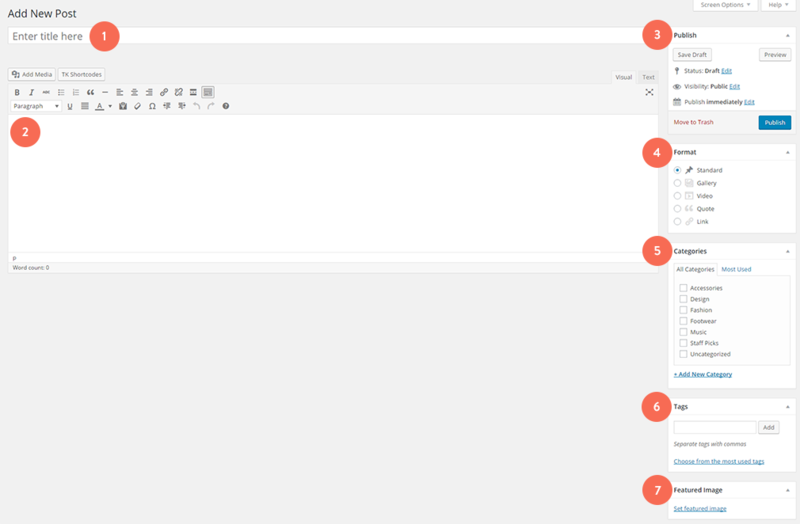 Project Tags: Tags are words that allows you to organize portfolio items by similar content. Set featured image: Featured image will be used as cover image on front end, and displayed on single page as well.